How Much Detail Do Your Procedures Require? Procedure details or when is enough, enough? Writers either put too much detail in a procedure and make their procedures too long and hard to use, or too little detail and leave out important information that may confuse the reader. So how do you know how much detail goes into a procedure? First, let’s clarify the difference between a procedure and a work instruction. Procedures represent your repeatable processes, while work instructions are made up of the details depending on what’s repeating. An expert, one who has used this process thousands of times, may not require a written procedure or work instruction, while a new person will find such process documentation immensely helpful. Let’s look at a simple example. Every night, most people have dinner. So the process of making dinner repeats, nightly. But, have you thought about what the dinner process looks like? 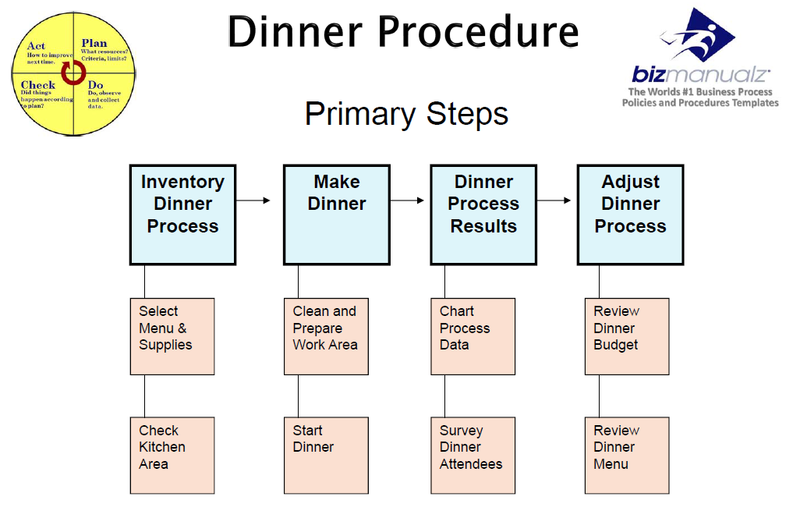 A basic dinner process, based on the PDCA model, consists of planning (P) the meal (perhaps based on the supplies available), doing (D) or making the meal, checking (C) the results (perhaps you ask the eaters what they thought of the meal), and then adjusting (A) the process for the next time you make dinner or that meal. Dinner may look different at every person’s house. Some expect dinner to always be at the same time, some want a lot of menu variety, and some may want it to be variable and as needed with no set time. But even with excessive variability, you may expect some staples to be in the house so you can cook something up as needed. So what are these staples? This dinner process repeats every night. A procedure for making dinner is at a higher level. It should describe the important information for repeating the dinner process and ensuring that your dinners are consistently made, meet your expectations (i.e. timeliness, quality), and improve over time. Process documentation like this is written for the semi-experienced or part-time cook so we do not need excessive documentation. They can cook but need helpful reminders about the process. Effectiveness Criteria: Dinner start & end time, health/diet guidelines, budget or quality standards. Responsibilities: Who makes the menu, shops for supplies, cooks, sets the table, cleans, etc. Primary Steps: Inventory or Planning, Making Dinner, Checking Dinner, and adjusting. Policies or Standards: In the US we have the food code, HACCP, FDA, and health department. While these may not apply directly to home cooking, their guidelines exist to keep food and your family safe. They represent a common set of standards to food preparation, storage, and serving. References: Work instructions, forms, training materials, etc. Other Data: (SOP) Standard Operating Procedures template may also include process maps, purpose, scope, revisions, definitions, and other references. The Making Dinner Procedure contains enough detail for a repeatable dinner that meets expectations. Your work instructions contain the remaining details. So far we have focused on the dinner process, which is focused on meeting the expectations for dinner itself. We have not talked about what’s served (menu), how to literally cook the meal (recipes), how certain tasks are carried out like cleaning, setting the table, or shopping. These might all be contained in work instructions. Who uses work instruction documentation? Work instruction are written for the inexperienced, new person, or when something is extremely complicated and we cannot make a mistake, so we do need detailed documentation. In this case, they may not have cooked much before and need more than helpful reminders about the process. They need exact, step-by-step details of how to do something or operate a specific machine or tool. Pictures: What the meal looks like, a proper place setting, the exact brand or item from the store, inventory locations, kitchen layout, etc. Work Details: Recipes, cleaning methods, cooking methods recipes refer to. Safety: Material handling, protective clothing, sharp objects, etc. Tips: Examples of when its right (i.e. should not stick to the pan). How do you know how much detail goes into a procedure? Procedures describe how to ensure repeatable processes, while work instructions contain the details of what’s repeating. What literally goes into your procedures depends on the skill level of your workforce, the maturity of your processes, the amount of mistake proofing, complexity of your processes, or the expectations of your customer. Everyone may have different requirements. Keep your procedures high level and then adjust your work instructions to provide the details that your process, workforce or training needs dictate. If you put too many of the work instruction details into your procedures your experienced workers won’t use them and the inexperienced workers will have trouble separating the process from the detailed methods. To learn more about Bizmanualz policies and procedures, download free sample procedures right now.